OK, here’s your Halloween treat: a revisit to Don Kenn (AKA John Kenn Mortensen), who continues to fill Post-It pads and other odds and ends of office supplies with pen drawings of his delightful ghouls, ghosts, demons and big furry monsters. See my previous post on Don Kenn. As an adjunct to their long-established model of direct questions and answers, Answers.com has launched a new “Category Expert Writer” program, in which writers with expertise in various areas contribute an ongoing series of short, informative articles in their field. This seems an attempt by Answers.com to provide more in-depth information than their other format allows, and to create a more blog or magazine-like reading experience. 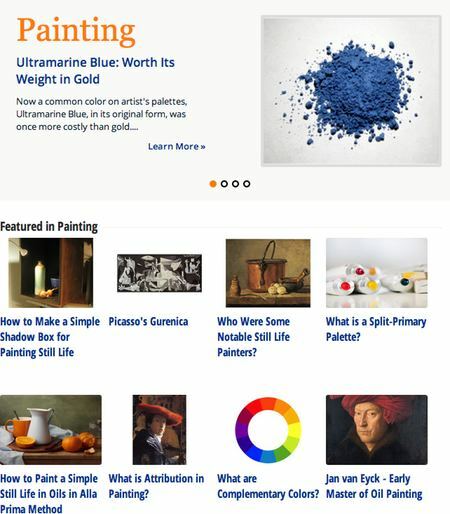 A couple of months ago, I was asked to be the Answers.com Category Expert Writer for the category of Painting, at: Painting.Answers.com. I will be contributing articles for the Painting category on their site on a regular basis, at least 10 per month, sometimes more. Not every article in that category is mine, but I will be the most frequent contributor going forward. So far, I’ve written about 35 short articles, roughly divided between historical topics on painters and schools of painting and instructional articles on painting technique and color. What are Drawing Problems vs. Painting Problems in Painting? Who Were Some Famous Surrealist Artists? There isn’t a full list of just my articles on the Answers site, but I’ll be maintaining one here on Lines and Colors, linked at left under the Answers banner as “A list of my Answers.com Articles“, or simply: http://linesandcolors.com/answers. So far, the ads that support the site are very general and seem incongruous with the content, but hopefully they may become more topic-specific in the future. I’ll try to include mention of new Painting.Answers.com articles in the future in my Twitter feed, but the latest articles will always be available here from the link in the left sidebar. On Google Art Project. Also downloadable high-res from Wikimedia Commons. Original is in the Dulwich Picture Gallery. German illustrator Maike Plenzke is still in the early stages of her career, as evidenced by the presence of some school related projects on her blog and website, but she is off to a very promising start. Her nicely stylized approach uses a muted color palette, theatrical application of lights and darks and a vibrant feeling of texture. I particularly enjoy the way she works elements of patterns and graphic shapes into her background objects, fabrics and plant forms. Museum goers here in Philadelphia will have a rare opportunity to see a Vermeer at the Philadelphia Museum of Art, as the painting Young Woman Seated at a Virginal, along with work by Frans Hals and Rembrandt pupil Gerbrand van den Eeckhout will be on loan from the Leiden Collection until March, 2014. Those of us who live in Philadelphia and love Vermeer have the geographical advantage of being within a few hours travel of twelve of his 36 known works: four in D.C. at the National Gallery and eight in New York (five at the Met and three at the Frick, plus one if you count the current loan of Girl With a Pearl Earring); but it’s rare, if ever, that we get to see one here in town. I haven’t been in to the Museum to visit it yet, maybe this weekend. Vermeer’s Young Woman Seated at a Virginal (as distinguished from A Lady Seated at a Virginal in London’s National Gallery) is one of his smaller works, at less than 10×8″ (25x20xm), and is believed to be one of last he painted. It is also the only Vermeer still in a private collection. There was some controversy about the attribution of this work over the years, but it has now come to be accepted as an authentic Vermeer. For more on the painting, see the description on the Essential Vermeer website. On Google Art Project. Also high-res downloadable on Wikimedia Commons. Original is in the Denver Art Museum.